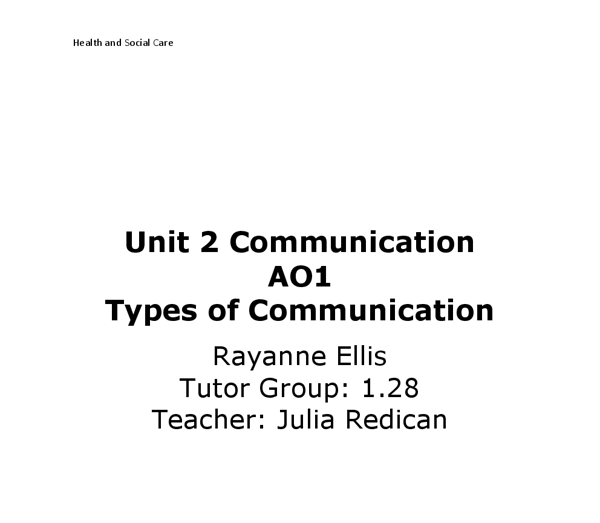 ﻿Health and Social Care Unit 2 Communication AO1 Types of Communication Rayanne Ellis Tutor Group: 1.28 Teacher: Julia Redican ________________ Contents AO1 Section A Oral communication 3-7 Written communication 8-9 Computerised communication 9-11 Special methods of communication 12-13 Section B Equality and diversity 13-14 Confidentiality 14-16 Individual Rights and Beliefs 16-17 Positioning 17-18 Emotional 19-20 Environmental 20-21 Special needs 21-22 Content of communication 22 Bibliography 23 ________________ Unit Two: Communication The word communication comes from the Latin word communis, which means to share. It is an important aspect of everyday life, especially in a health and social care environment. This is because it is a way in which a service user and provider can share and obtain information. It can help express emotion for example a service user may feel unhappy about a certain aspect of their care they can use communication to let their service provider know this. They can then discuss between them what the service user may feel is more appropriate, this helps make the service user feel more valued as their service provider has used oral communication to help make sure their care is more specialised for the service user. It is also a necessary to build up a rapport the only way a person can get to know another person is through communicating with them so they can understand their personality traits and their feeling towards them. Trust is essential to the developing of a rapport communication is the only way in which a service user is going to feel they can trust a service provider. 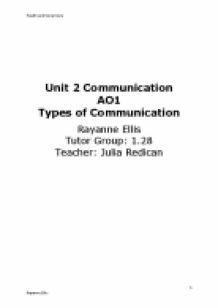 There are four types of communication: oral, non-verbal, written, computerised and special Oral communication This is where a person approaches communication with others through speech, language and verbal sounds. Unlike other methods of communication it includes non-verbal communication, this is used along side oral to show how a person may feel about the communication happening. ...read more. this can cause them to feel socially isolated. however to overcome this barrier certain communication methods have been developed by these people such as for someone who is deaf their first language may be British Sign language, or if someone is visually impaired they may use braille in order to read written communication. another method is Makaton which is a language to help people who have learning difficulties. British sign language British Sign language is a communication made up of visual signs from hands, arms and body gestures. for many deaf people it is their first language. in 2003 following a big campaign BSL (British sign language) was finally made a minority language. However BSL users can still find communication barriers as not all service providers can be accessed through BSL. It is also not a universal language as it is often mistaken as being, there are many dialects to it, it can even vary between regions in Britain. BSL has to be learnt it takes training and to be good at it, it may take years, this can be a time consuming and costly process. For a BSL user to communicate with someone else using BSL the receiver has to understand BSL and know how to respond to it. this can be a problem in health and social care settings as not everyone knows sign language which could cause a communication barrier between a service provider and a service user. This makes the service user feeling isolated and has a negative impact on their self worth. Which could prevent the service user?s illness being treated, they do not want to go back to the care setting, or because bad quality care is given due to the communication between the service provider and user not being understood. But if a service users service provider provides BSL then this can help the client feel valued and supported as it is not inhibiting the communication between them it also makes the client feel like the service ...read more. Sometimes the main point of a conversation is to have small talk to talk about each other?s lives in general and maybe developing a deeper relationship. An example of this could be in a doctor?s surgery during the period of waiting to see a general practitioner. Clients may sit around and chat amongst them self?s to pass the time this would be small talk as the clients wouldn?t know each other and may not want to intrude on a person?s personal life to deeply as this can be seen as rude. Conversations that involve business, asking questions, or discussing ideas are known as task-focused conversations. These sorts of conversations use skills like asking closed or open questions to find out the information needed. Such as a social worker may be given a new case study they meet with the client and after having a bit of small talk the social worker begins to ask questions about the clients health and wellbeing to help make it clear to the social worker what sort of care they need to organise for the client so they get good quality and individualised care. Other conversations involve focusing on emotional issues. For example it would be predicted that a counsellor would have an emotional conversation with their service user as the service user will be sharing their worries emotions and problems. So the counsellor can help the client help them self?s. It?s important that whatever the type of communication as a service provider you have the skill to change the style of response you give. To make sure you are on the same level as a service user and support them, through following the care values such as treating service users as equals but valuing their diversity and identity. Making sure their privacy is protected by following the guidelines of confidentiality. Identifying a service user?s culture and making sure that factors such as emotion, positioning, environmental conditions and special communication needs are all taken into account before communication takes place. ...read more. Keeping records of these things helps other service providers to know the clinical history of the patients, health condition and to carry out with further needs. Some of the examples of written communication are the letters sent to the patient, reports, appointments, notes, prescription etc. are just 2 of many possibilities Client often approach this matter obliquely by saying " I am feeling so much better now" or they may give clue the want to end the relationship, by missing or been late for sessions, or wanting to leave early. Written communication is permanent and accurate which can be used as reference later on. In care settings, written communication is used to keep the medical record so that other care workers or service users can use to comment on the patients health or anything they need to add on. This will happened because it's attached to his sexual orientation. Health status - Health status is another cause of discrimination this is attached to the levels of good health or an illness that is being experienced by an individual. A health care worker will discriminate to the service user or another individual. Whereas in non-verbal communication it could be sign language, signs, symbols, gestures, writing etc. After someone has expresses something either verbally or non-verbally the next step would be to watch the other person's body language to see their response. Source: http://www.bsos.umd.edu/socy/research/rosenberg.htm 1. Abrahams Maslow?s hiracery needs: Abraham Maslow is well renowned for proposing the Hierarchy of Needs Theory in 1943. This theory is a classical depiction of human motivation. This theory is based on the assumption that there is a hierarchy of five needs within each individual.